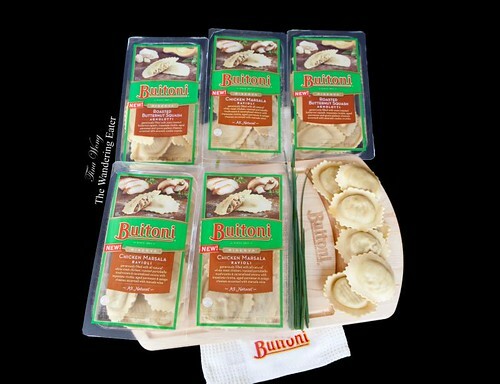 Recently, Buitoni Pasta was generous to ship me a thoughtful package consisting of their limited distribution of fresh filled pastas – Chicken Marsala Ravioli and Roasted Butternut Squash Agnolotti to experiment, a soft bamboo fiber hand towel, an apron, and a cutting board from Vermont. 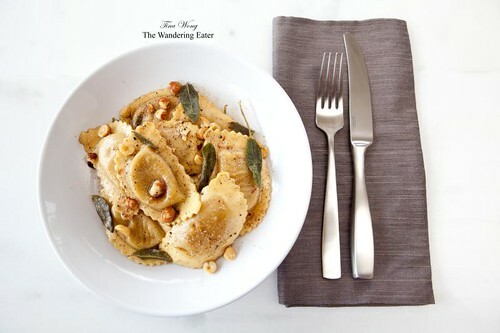 For their butternut squash agnolotti, I paired it with a brown butter sauce with sage, toasted hazelnuts and a touch of grated Parmesan cheese. The aromas of this sauce is mesmerizing. The nuttiness of the brown butter, herbaceous touch from the sage, crunchy toasted hazelnuts, and the salty punch from the Parmesan worked wonders for the agnolotti. 1. Cook butter in heavy large skillet over medium heat just until golden, stirring often, 3 to 4 minutes. 2. Add the chopped sage and stir for 1 minute. 3. Add the agnolotti and cook until heated through and coated with butter, 5 to 7 minutes. Season with salt and pepper. Add the hazelnuts. Transfer to bowl. Sprinkle with 1/4 cup Parmesan. Serve with additional Parmesan. As for their chicken marsala ravioli, I realized when I ate it plain (cooked, of course), there were fine bits of mushrooms mixed within. It’s subtle but you see it. I envisioned a red sauce (tomato-based) that has mushrooms. It’s a bit heavier and it will take more time to make than the brown butter sauce but it’s worth the effort. 1. Heat oil in heavy large skillet over medium heat. Add onion; sauté until tender, about 10 minutes. 2. Add garlic and sauté for 1 minute. Add mushrooms and crushed red pepper; sauté until mushrooms just begins to soften, about 5 minutes. 3. Add the tomatoes and reserved juices. Cover and simmer for about 15 minutes. Add tomato sauce, sugar, basil and oregano. Cover and cook for another 15 minutes. 4. Uncover and simmer until slightly thickened, about 5 minutes. Season with salt and pepper. 5. Add the cooked chicken marsala ravioli and 2 tablespoons parsley to sauce. Transfer to large bowl. Garnish with remaining parsley. The first recipe calls for flour, but I don’t see it used in the directions. I’m guessing that’s an error? 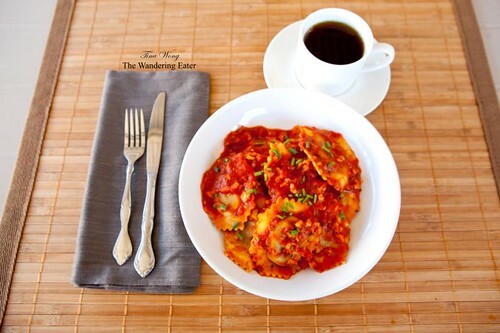 I like these agnolotti cooked per the package directions and drizzled with walnut oil. I like your idea with the brown butter, sage, and hazelnuts, though. I’ll have to hunt down some hazelnuts and try it!